Work on the game has gone poorly since I returned from Detroit. At first, I thought it was a problem related to routine, or lack of one. It's been difficult to find time to work on the game. As it turned out, though, I had it backwards: I didn't have a routine because I was beginning to panic. Once Gridiron Solitaire went out for the Friends & Family beta, I immediately realized that the Stop The Drive meter just wasn't good enough. I've been fairly pleased with it for a while, because it was a big improvement over what came before, but I think I've always known that it violated one of most basic principles I followed when designing the game: everything must be football. The meter isn't football. As someone put it, "It looks like a United Way telethon." Ironically, that's one of the reasons I chose it--it's a universally-recognized symbol of a goal to achieve--but it fails badly in the "fidelity to football" category. This has bothered me more and more in recent weeks, to the point where I was putting off working on other things because it seemed like an intractable problem. It wasn't good enough, I knew it wasn't good enough, and I didn't know how I could make it better. On Saturday, Gloria and Eli 11.0 left for the summer 4-day trip to Shreveport. No matter how busy I am, I can always navigate in my head from point A to point B. For most things, that's enough. I can also usually get from A to C. Longer hops, though, are quite difficult, because I don't have enough uninterrupted time to think. Suddenly, though, I had time. I sent Frederick an e-mail, asking him for suggestions about the physical appearance of the meter. I told him I wasn't sure what, exactly, but I felt like we had an opportunity to modify the look of the meter. I thought it was a bit fat, for starters. In short order, he sent back a graphic that wasn't as wide, plus the background color was the color of the scoreboard instead of a sky blue. His reasoning? It was a non-interactive element that provided information, just like a scoreboard element. That was an excellent point, and I agreed. That one comment, though, made me start thinking. The first thing I realized was that the meter should be docked to the scoreboard. After some mucking around in a paint program, I decided it could be docked to the right or left edge, depending on what direction the CPU was driving. The meter would have to be smaller, but that was okay. It looked much, much better when docked to the scoreboard. Still, though, something bothered me. I wanted something besides the meter. Something that could also be docked to the scoreboard, but would be explicitly football-related. That's when I realized I could dock something to the bottom of the scoreboard, wider than the text box, but the same height. What if I put the image of an offensive player at one end, and a defensive player at the other end? 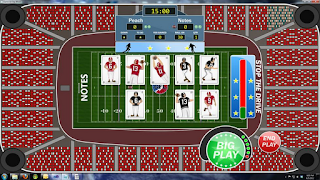 When the user played cards, the defender could move toward the other player, and if he reached him ("tackling him") before the drive ended in a touchdown, then the drive would be stopped. As soon as I had that thought, I realized that was the correct idea. At first, I thought the box would be much wider than the scoreboard, but as soon as I mocked it up, I realized that was far too wide. To look like a natural part of the scoreboard, it needed to be just as wide as the scoreboard. One more thing: it would look much more natural if the defensive and offensive players move toward each other. They would meet at the 50-yard line (symmetry), triggering a tackle image. It's hard to explain, but I look at that and know instinctively that it is "right." That's exactly what it's supposed to be, and it should have been that way from day one, but I just couldn't see it yet. The old meter looks incredibly clunky and out of place in comparison. Also, that little background strip has unique backgrounds for sunny, rainy, and snowy weather, so it will match the field background graphic. I've also added a wild card to the deck. It matches any card on the field, and it's added a bit of strategic spice to the card play. It's also caused some play balancing issues, but I accidentally designed the game in such a way that it's easy to adjust the play balance (seriously--there's no way I could've done it on purpose). So after a few weeks of little progress, finally a significant step forward.